Creative Expressions was co-founded by two sisters about one-and-a-half years ago. They produce bilingual products for teachers in the fields of English, Spanish, ESL, and math. Their article about enhancing self-esteem of at-risk students validates their belief that all students can learn under the right circumstances. We have too many students who are at risk, and as teachers we need to help them improve their self-esteem whenever possible. Sometimes, we just do not know how to make students feel good about themselves. This article provides eight tips that we can use to help at-risk students improve their self-esteem. Sometimes we get so overwhelmed with the responsibility of teaching that we forget the easiest thing that will help our students feel better about themselves….A SMILE. We start believing that we have to frown until Thanksgiving to help discipline. But, when we don’t smile, students think that we don’t enjoy our jobs and that we do not enjoy having them in our classrooms. Many times, a smile will make our students’ day and will make them feel like someone cares about how they feel. At-risk students will feel like the teacher with a smile is approachable. They will feel comfortable about approaching this teacher when they have bigger problems or are feeling all alone in the world. Many of our students who are at risk have learning challenges, can’t speak English, or can’t sit still, but we can make them feel they are part of the group. How can we do this? If these students have problems keeping up with assignments, then find a buddy for them who will help make sure that the students understand what is happening in the classroom. You can assign a different buddy every day, or you can have students volunteer to be a buddy. Teachers can also provide tutoring time to help these students keep up with learning in the classroom. Don’t forget that students will be more successful with learning if we provide differentiated assignments. Yes, it takes a lot of precious time to provide differentiated lessons, but our students and their self-esteem are worth it. Too often we think we are doing at-risk students a favor by providing them easier assignments than the rest of the class. At-risk students want to learn what the other students are learning. Maybe they need a differentiated assignment for them to learn, but they can do it. You may have to provide at-risk students with additional notes or sometimes an assignment in a different language. Easier and different assignments are not the answer. Students need tools to make them successful in the classroom. Many times, we have these resources in our classrooms already. Do they need a special dictionary to help them complete their assignments? Provide them with one. Do they need a bilingual student to help them understand an assignment? Provide them with a buddy who speaks their language. Maybe they need a special visit to a counselor who will provide that student with some information during a 15-minute discussion. Refer them to the counselor. I’ve seen teachers sit students at their desks so that they can monitor their work and eliminate distractions for the student. If this is what it takes, why can’t we do it? Many at-risk students will say negative things about themselves. Teachers can turn these negative comments into positive ones. They can constantly praise the students and remind them that they can achieve and learn. Teachers can consistently praise students about their strengths so students believe they can be successful in spite of their challenges. Teachers can role model by discussing their own strengths and challenges. Students sometimes see teachers as being perfect, but they should see and hear teachers describe and explain how they have succeeded in spite of their challenges. Teachers can also provide activities related to other successful role models from various cultures who have achieved great things in spite of many challenges that they faced. Role modeling of this type can help students believe in themselves. We think students might understand this concept if you have them read The Geometry Lesson, a Narrative of Unconditional Love, written by Creative Expressions. Teachers should believe that every single student can learn and be successful. Educators need to avoid talking to other teachers about the students with behavioral issues. When we talk about students, it is easy to label students negatively. Sometimes students behave negatively because they are desperate for attention. Believing that students can succeed means that we have to engage in reflective thinking ourselves to identify misconceptions and stereotypes that we might hold. Identifying those beliefs allows us to change them. Once those misconceptions and stereotypes are changed, we firmly believe that every student can achieve to their utmost potential. Guess what? They do! Self-esteem activities are important in the classroom. 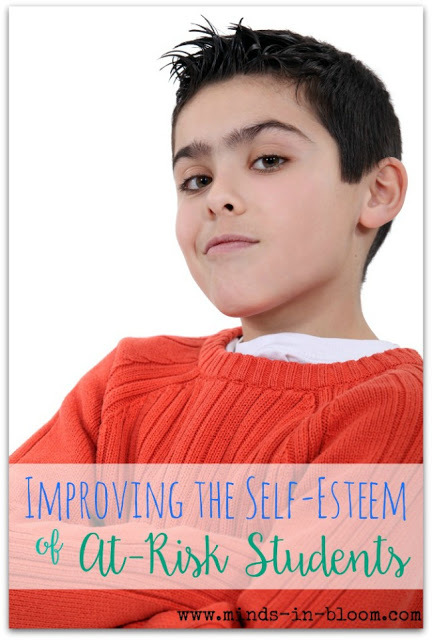 There are many great self-esteem activities to help students improve in this area. Teachers can definitely help students improve their self-esteem by smiling at students and making them feel part of the group. Providing students with meaningful assignments and resources are very important to help students feel better about themselves. However, if we don’t believe in their ability to learn and succeed, then how can we expect them to achieve their dreams? Hopefully, you will find these eight tips useful in your classroom so that improving students’ self-esteem can become a daily activity in all of your classes. Creative Expressions was co-founded by two sisters about a year-and-a-half ago. Both co-founders are in the field of education and published authors. They enjoy reading, writing, and spending time with family. Visit their blog to learn more about their work. All great suggestions! I love the "smile" as #1. It's so true that students need to know you enjoy your job with them or they feel like it's them you don't like.